Adidas victory league celebrates victories & new achievements of football teams. 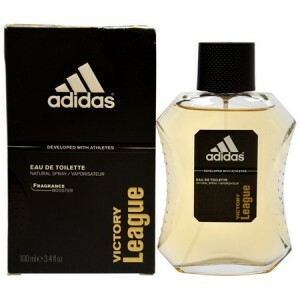 Adidas victory league cologne 100ml. Eau De Toilette for men is a refined fragrance for a reliable man who believes in individual performance and also knows that only a team effort leads to victory. Elegance along with the freshness accentuate your masculinity and charisma and flamboyance to multiply your success. This fragrance will flavorful friend during a busy working day, but also at the evening party, which perfectly complement the individual strength of your personality. Head smell Victory League opening chords of fresh bergamot, fresh basil leaves and green tones. The heart conceals juicy pear essence sprinkled delicately sweet cinnamon and intoxicating lavender. Finally, an interesting scent creates captivating cedar, sensual musk and vanilla exciting. Adidas Men's perfume can be used in any situation during the day and during sports activities. This fruity-spicy fragrance motivates individual performance, and yet does not forget the power of a team effort. Men's fragrance Adidas Victory League gives you the determination to tighten things up a successful end. This passionate and winning eau de toilette, which carries the charge of optimism and cheerfulness. Its creation is associated with a great football event - the World Cup, which took place in 2006, which accounts for a sporty and dynamic character. Aroma is addressed strong men-winners, for which there are no barriers, that in order to achieve their goals are willing to take any risks. His chosen sport, stylish men, adventurers by nature, seeking only forward, overcoming all obstacles. In a moving and refined fragrance, first felt a thrilling anticipation of victory, the excitement of wrestling, which is incomparable to anything. The first chord appears ravishing freshness, whose intriguing accents basil added. Over time, striking a delightful combination of floral and fruity notes of, shaded wonderful spices. Deep, warm and soft loop is formed at the expense of a delicious combination of a noble sense of music and fine woody chords.